Local reports say that the woman was snatched from her home in Sao Paulo. 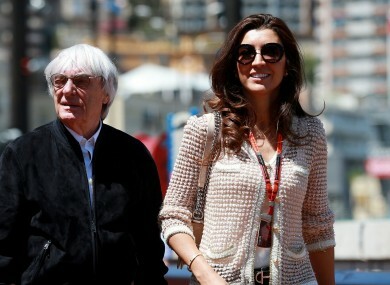 F1 CEO Bernie Ecclestone and his wife Fabiana Flosi in Monaco. THE MOTHER-IN-LAW of Formula One boss Bernie Ecclestone has been kidnapped for ransom in her home city of Sao Paulo, Brazilian media reported Tuesday. Aparecida Schunck Flosi Palmeira, 67, was seized Friday night in Interlagos, the Sao Paulo neighborhood that hosts the Brazilian circuit of the F1 Grand Prix, TV Globo reported. There was no confirmation from Brazilian officials or from Ecclestone’s staff in London. “We neither confirm nor deny this report,” a spokesman for the regional security ministry told AFP. That is our policy in cases of suspected kidnapping, to avoid putting the lives of potential victims in danger. According to Globo, the kidnappers are already in contact with the victim’s family. The Veja weekly reported that they were demanding payment of a ransom in pounds sterling worth 120 million BRL (€33 million). Aparecida Palmeira is the mother of Ecclestone’s 38-year-old Brazilian wife Fabiana Flosi, who met the 85-year-old billionaire while working for the Interlagos Grand Prix in 2009. The couple married in Switzerland and live in London. Email “F1 boss Bernie Ecclestone's mother-in-law 'kidnapped and held for €33 million' ”. Feedback on “F1 boss Bernie Ecclestone's mother-in-law 'kidnapped and held for €33 million' ”.